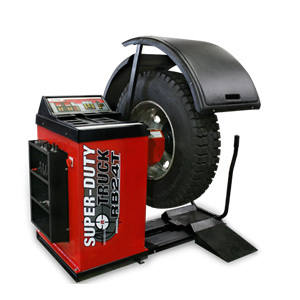 Ranger - Super‐Duty Truck Wheel Balancer with Drive‐Check™ Technology - Gary Bloom Sales, Inc. 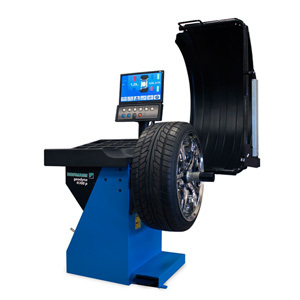 The Ranger RB24T truck wheel balancer is a heavyweight wheel balancer suited especially for high‐volume commercial tire dealers and truck fleets. This is a REAL truck balancer with REAL FAST start up and REAL FAST braking speeds. Most bargain brand balancers on the market are simply standard balancers with larger mounting cones. Those less advanced truck balancers take forever to get heavy wheels spinning up to speed then take just as long to get heavy wheels to stop.The Ranger RB24T truck wheel balancer is a heavyweight wheel balancer suited especially for high‐volume commercial tire dealers and truck fleets. This is a REAL truck balancer with REAL FAST start up and REAL FAST braking speeds. Most bargain brand balancers on the market are simply standard balancers with larger mounting cones. Those less advanced truck balancers take forever to get heavy wheels spinning up to speed then take just as long to get heavy wheels to stop. 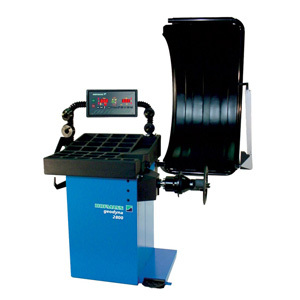 The Ranger RB24T truck wheel balancer is a heavyweight wheel balancer suited especially for high‐volume commercial tire dealers and truck fleets. 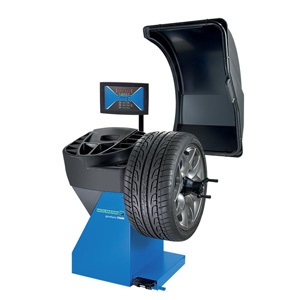 It handles tires up to 50 inches in diameter and 20 inches wide and rim sizes up to 30 inches in diameter. Although best suited for bus, truck and OTR wheels, it’s capable and fully equipped to accommodate automobiles and light truck wheels as well. 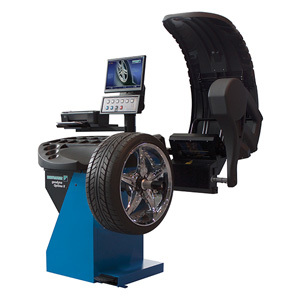 Featuring Ranger’s proprietary Drive‐Check™ technology, it’s a powerful, vibration detection balancing solution that simulates road and driving speed conditions and measures computer‐generated imbalance of the tire and wheel assembly automatically. It then recommends the most cost effective weight optimization correction as needed which minimizes weight usage and maximizes productivity. An integrated wheel lift easily lifts the heaviest wheel assemblies for effortless mounting on the balancer. Standard Cone Kit ‐ The RB24T tooling package includes a fully equipped six‐piece cone kit for full coverage of most all wheel configurations from cars and light trucks to super‐duty truck, bus and OTR. This well‐equipped package includes five standard cones and one dual tapered cone; individual cone sizes; 2.00‐2.75, 2.75‐4.00, 4.00 – 5.75, 6.00 – 6.50, 6.75 – 8.00, 8.25 – 9.00, and 10, 75 – 11.50. Wheel Weight Starter Kit – Free samples of Ranger steel wheel weights are included. Starter Kit includes; one bulk roll of 100 silver adhesive steel tape weights, one bulk roll of 100 black adhesive steel tape weights, and one starter box of mixed clip-on steel weights.